-Preparations are in full swing at the hotel where George Clooney and Amal Alamuddin will be partying during their wedding weekend, and celebrity guest have begun to arrive, including Matt Damon, Anna Wintour and Ellen Barkin. It’s so weird; they’re being so open and un-private about it that they even have a photographer documenting the couple’s every moment. 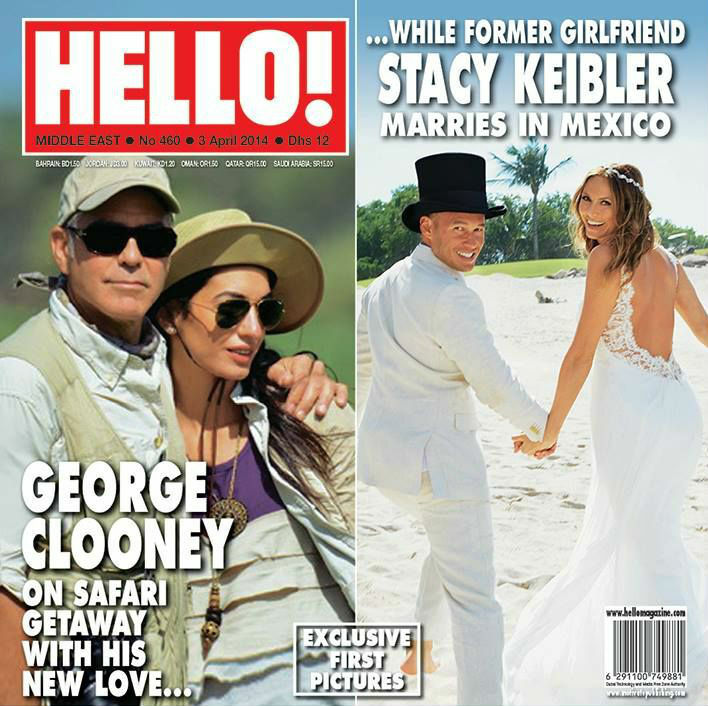 Not that I’m not looking forward to seeing every single possible shot from the wedding tomorrow, but it all feels so unClooney-like. –Katharine McPhee hasn’t learned her lesson about not eating where you poo; she’s now dating her Scorpion costar. -Congrats to Sam Worthington, who is expecting a baby with girlfriend Lara Bingle. –Iwan Rheon is in a new movie in which he does a terrible Southern accent but I’ll still watch it because he’s Simon from Misfits and I love him. –Chris Pratt was adorable on Fallon last night, telling a funny story about his first headshot and playing Word Snake. He’s going to kill it on SNL this weekend. –Chris’s wife Anna Faris prank-called him on Ellen, and it was hilarious/mean. –Pornstache (nee Nick Sobotka) is reportedly dating DWTS pro Karina Smirnoff. –Rose McGowan says a racy Rolling Stone cover made her give up Hollywood. It might be easier to take her fight against the objectification of actresses more seriously if she didn’t regularly show up to events in outfits like this. -People Magazine should not get a racially insensitive intern to man their Twitter feed during #TGIT. -Speaking of #TGIT, Scandal scored its biggest ratings ever, and How To Get Away With Murder tied it, proving that Shonda can open TV shows like actors open movies. -Speaking of TV, I really loved this article about how it’s a golden age of television criticism. -The Fault in Our Stars got the Honest Trailer treatment, and it’s great. –Samuel L. Jackson is giving Bill Murray a run for his money in the Celebrities You’d Want to Do Karaoke With game. -Every episode of Gilmore Girls is now on Netflix, which has led to a lot of articles being written this week about that show. This one might be my favourite, since it points out that Lorelai and Rory were often terrible human beings. I loved that show — but I also remember completely agreeing with Mitchum Huntzberger‘s assessment of Rory. –Victoria Beckham skipped her London store opening to deliver passionate UN speech about HIV, which is pretty boss. –John Cusack says it’s hard out there for rich, white dudes in Hollywood. Uh huh. –Kanye West’s man-cleavage stole the show at Paris Fashion Week. -The new Jupiter Ascending trailer tells us two things: Mila Kunis has always loved dogs, and this movie might be terrible.